Sautee 1 chicken breast - cut into small pieces - in a bit of peanut oil. 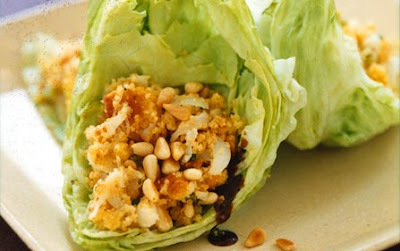 Once the chicken browned, I added honey and soy sauce, crushed cashews, and crushed pine nuts. Then I cooked it all a bit longer to warm the extra ingredients. I put it all in a bowl to spoon into my lettuce, roll up and eat! I chowed this meal down! Lessons learned, pre-wrapping the hot chicken in the lettuce leaf makes the lettuce wilt - I didn't realize this at first for some odd reason. This was a great (even healthy) meal. Now I cannot wait to make a big batch!